It’s been almost two years since I made of the most important purchases of my life – my Amazon Kindle Keyboard 3. It’s still going well. Although I do most of my reading on my iPad nowadays, my new ebooks are always loaded on to my Kindle first, it’s still the best device for bedtime reading and I always take it alongside my iPad in my backpack. It was the Kindle that really got me into ebooks, and as a result I have saved so much money and reduced the amount of books that would have otherwise taken up even more space in my already cluttered home. As well, as I have travelled more and more during the past few years, ebooks have helped to make travel easier (not having to pack books) and more enjoyable (having, at last count, 1144 ebooks to choose from at any moment). Yes, 1144 ebooks – and thanks to sites like Kindle Nation Daily, Pixel of Ink and Book Basset, a growing number of ebooks during the past year have been free. During the past few months, I’ve been averaging perhaps one free new title a day. Most of my ebooks are still bought, however. Each fortnight on payday, one of the first things I do is visit Amazon and spend $50-100 on new ebooks. Also, in the two weeks between each payday I may buy one or a few more ebooks depending on specials or which author or what subject has suddenly grabbed my interest. As well as the lower price of ebooks, the internet has made available an even greater variety of reading material. As well as other blogs and online articles, podcasts like The KunstlerCast and those from the New Books Network are always pointing me to intriguing-sounding titles that I may have otherwise missed. 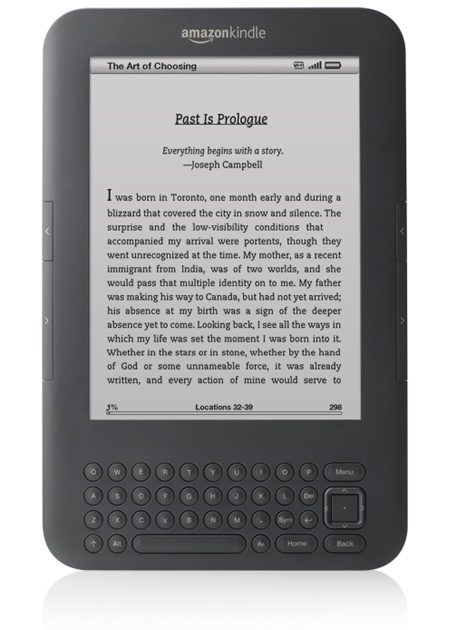 So thanks to the gateway device that is my Kindle, ebooks have become a huge boon to my life. This entry was posted in Bibliophilia, Gratitude, Happiness, Life is Good, Life Strategies, Reading. Bookmark the permalink.